This is a simple seven-slide PowerPoint, with big pictures and powerful quotes from parents of Angel Tree recipients. It is ideal for giving an introduction to the Angel Tree programme, and you are welcome to use it in your church, small group, community group or any other context it might be useful! Click on the button below to download the PowerPoint to your computer. 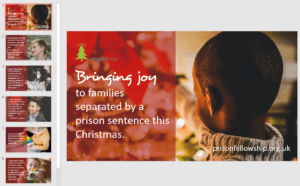 You are welcome to use it in any context where you are promoting the work of Angel Tree and Prison Fellowship.